So far this year, gold has outperformed stocks, up 2.5%, about what the Dow Industrials are down, for a 5% difference. Still, gold’s performance this year has been disappointing to many investors considering the huge downside moves that stocks put in this year. For 2017, the S&P 500 gained 19.4%, the Nasdaq 28.2%, and the Dow added 25.1%. Only Pollyannas expect such stock returns in 2018. Clearly, the trend for gold and stocks has changed. The changes simply have not yet registered with investors. Driving gold’s price rise was increased buying via ETFs, which added 22.5 tons in March. The bulk of the inflows were in North American-listed funds, which added 21.5 tons. ETF gold holdings now total 2,415 tons, up 47.3 tons the first quarter. As previously noted, physical gold movements in and out of ETFs have indicated future trends in the price of gold. If Trump continues to add products to his tariff list, the dollar will weaken, and, historically, stocks have declined during trade wars. Watching the talking heads on TV, there is much speculation that Trump will not make this a trade war but will use threats of tariffs to force concessions from our trading partners. Truly, the US is on the short end of nearly all our trade agreements. 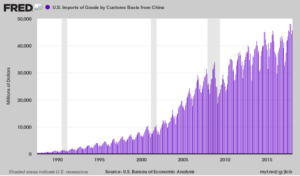 Trade wars often escalate despite the intentions of either side. And, it is to be remembered that Trump throughout his campaign promised to renegotiate our unfair trade agreements and talked about a weaker dollar to help exports. He is now acting on those promises. Stocks will suffer, and gold and silver will benefit.